American Independents - Is Bill Plympton the only animator to single handedly produce and animated feature in a one room New York loft? Japanese Animation - A probing look at controversial Japanese director Yoshiaki Kawajiri. Feature Films - Paramount pictures enter the "Animation Sweepstakes" with two daring features targeted at a new audience. 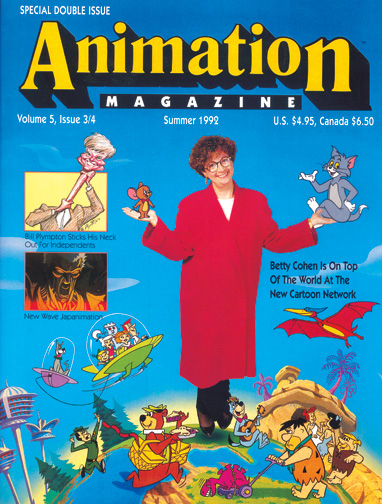 Sidebar - A brief history of Paramount Animation. Computer Animation - MetroLight's computer animation system named Annie battles production budgets with style. Computer Animation - Homer & associates is pioneering new technology called "Motion Capture". International Animation - Guido Manuli and Maurizio Nichetti's VOLERE/VOLARE is a charming mixture of animation with live action. Historical Perspective - A tribute to Mark Davis: One of Walt Disney's celebrated "9 Old Men".